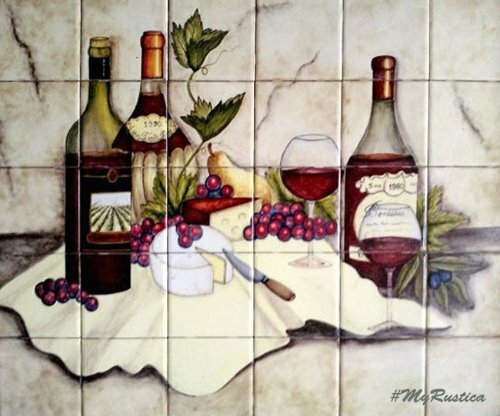 Kitchen Tile Mural "Cheese Wine"
Artisan produced kitchen tile mural for a backsplash wall in colonial style. Decorative talavera tiles from Mexico with "Cheese and Wine" 24 x 20 inch design in white, green and wine on a gray background. This artisan produced kitchen tile mural is available painted on 4x4 or 6x6 talavera tiles and free delivery to Mexico, and the US. Kitchen Tile Mural "Beautiful Catrina"
Kitchen Tile Mural "Wine and Fruit"